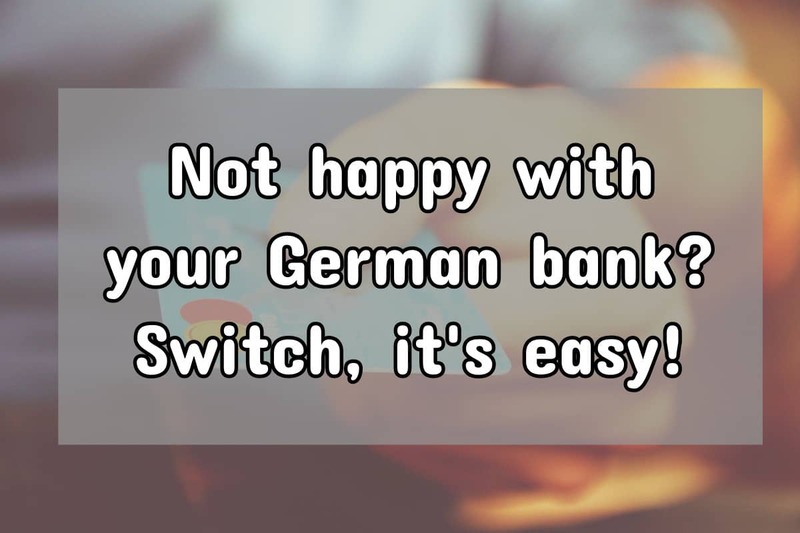 So perhaps you're not a newbie expat but you like what you've seen in our article on the best German bank account for expats and want to switch to one of the providers we recommend? Newcomers to Germany often don't choose the best account for their personal circumstances when they first arrive. Usually this is for reasons of expediency: the need to have a bank account set up quickly in order to receive a salary or pay rent. Also, a common problem is not being accepted by the bank of their choice because of not having any German credit history with SCHUFA. When you first arrived in Germany, likely you chose your bank account either based on what your colleagues, friends or someone in a Facebook group or expat forum advised you. Or you chose the bank with a branch located conveniently close to your home or workplace. If you lived here for a while and are kicking yourself for opening a German bank account which has crappy customer service and inconvenient opening times, the good news is that switching your bank is not that hard at all. A new law which came into force in September 2016 allows consumers to switch thier German bank account much easier than was previously the case. Claims made by some banks' advertising that you can “switch your bank in less than 10 minutes” are, however, in our opinion, extremely optimistic. Banks must now offer a service which automates and performs the annoying, administrative tasks which put most people off switching their banks. The law stipulates that the customer's incumbent and new bank must cooperate with each other and enable a simple and fast account switching service with easy access to recent transaction history. Furthermore, both banks are liable for compensation if anything going wrong during the switch which is their responsibility for carrying out. Whilst it is also possible to carry out the account switching service in branch, the law is primarily directed at consumers who would carry this out online. This online service should be free on all banks' websites. Switching in 10 minutes may be unrealistic, especially for somebody navigating a German website with limited knowledge of the language. However, that doesn't mean the process is complicated. Even if you are dependent on a website translation tool such as Google Translate, this process from start to finish should be possible within 1 hour. After applying for your new bank account, you then have to go to the account switching service on their website (Kontowechselservice). All banks based in Germany will offer this online. Normally this will be found in the personal banking area after you have logged into their site. NOTE: You cannot do this until you have opened an account and your new bank has provided you with an online banking user ID. 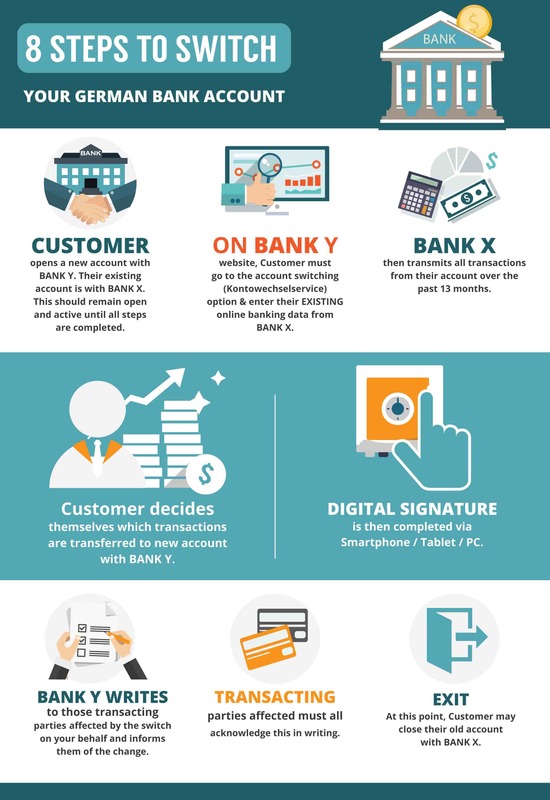 Once you are inside the account switching service on your new bank's website, your incumbent bank must provide an overview (online, on the new bank's site, through selecting your old account's details) of all transactions from the past 13 months. Doing this online is free of charge. What's more, many banks also offer sign-up bonuses for new customers opening current accounts, so it may just be the most productive hour you have spent in a while! So that's the theory. There are, however, a few areas where this seemingly simple process could get stuck in the mud. Forearmed is forewarned! Direct debits vs. one-off payments:In the list of transactions from the past 13 months which your current bank is obliged to provide, any and every electronic payment will show up in here. Only you are able to know what is an important, recurring payment to be transferred to the new account e.g. rent, gym membership, internet, versus what are one-off payments e.g. groceries, petrol, meals out etc which are not relevant. You need the transacting partner's address info:You must provide an address of the transacting partner for your new bank to write to them and inform them of the change in account details, in order for payments to continue uninterrupted after the switch. This is not always obvious from your bank statements, so may require some preparation in advance. Issues with standing orders (Daueraufträge): According to Stiftung Warentest, regular, scheduled standing order payments are not easy to transfer using the banks' online switching service. The most simple way to do this is to manually cancel them with the current bank and set them up with the new bank. Online payment providers:The likes of Ebay, Paypal and Amazon require you to amend your bank details in your profile on their website. Your new bank is not authorised to do this on your behalf. (Non-)Acceptance of digital signatures:Some transacting partners may refuse to accept digital or scanned signatures. You may therefore receive correspondence asking you to confirm with an ink signature and return the letter by post. if you speak German, then a great reference source for this article was the June 2017 edition of German consumer magazine Stiftung Warentest, “Finanztest”.